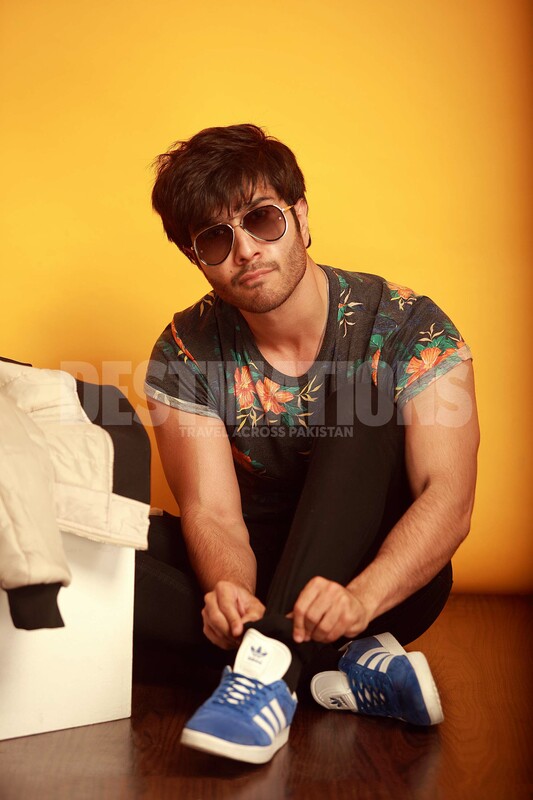 Feroze Khan just wants to live the dream and then live to tell the tale. DESTINATIONS talks to the enigma who has risen like a phoenix but remains as mythical as the unicorn. How he got here, where is he headed next and why there’s no stopping him, here he sets the record straight on all matters of fame, family and faith. As he steps into the studio, the vibe changes – energy levels shoot up, the lights come on, the music gets louder and on a balmy Karachi spring afternoon, the bright sun blazes stronger than it ever has before. Feroze breezes in wearing a lightweight jacket, something that James Dean would have rocked on a cool Cali evening. The moment we have been waiting for arrives: the camera lens zooms out, Feroze strikes a pose, quite a few in fact, and we see magic in the making. For someone as young as Feroze, this deep resonance with faith is certainly not commonplace. “My family and I have been through some rough times. Therefore, every single day we are thankful for what we have.” It is no surprise then that while other TV/film actors and anchors queued up for hosting Ramzan shows, Feroze with his mother and his sister, film star Humaima Malick made a trip to Mecca to perform Umrah (a pilgrimage of gratitude). It seems God has been kind to the Malick-Khan clan. While both the siblings are fairly successful actors and models in their own rights, Feroze gives credit to his sister for watching over him, lighting the way and leading him in his early days. In between shots, we hear whispers of things getting a little out of hand on social media. There are murmurs relating tales of aggression and smack-downs. “See, opinion matters to me. Stardom comes in a package – there’s lights, camera, action, fans, social media likes, brands, money and then, opinions. So when I read things about myself which are not true, sometimes, just sometimes, it affects me and I react.” However, his social media fan base has only continued to grow. Feroze’s Facebook page remains updated with all his news and current happenings and he has a verified Instagram account with almost five hundred thousand organic followers – a crucial metric in the heartthrob sweepstakes. There’s no denying that Feroze is a handsome man. What is brilliant is (apart from the obvious gender difference) his uncanny resemblance with his sister, also a very good-looking person. One look at him and you cannot help but notice the same chiselled jawline, pointy chin, sharp features and the now-famous thick eyebrow. But family association, a piercing gaze and a charming smile do not make a career. There needs to be more to set him aside from the sea of hunks washing along the teeming shores of TV. The pivot takes the form of Zain, a struggling filmmaker in Zindagi Kitni Haseen Hay. At such an early stage in his professional life, it has established Feroze Khan as the dynamic hero who can lead a film independently. It seems this young Khan has a knack for making odds work in his favour. “There was a time when my mother had a bad accident and was fighting for dear life. At that point, two things happened: 1) I understood the value of family and how important they are; 2) I resolved to make my family and my country proud of my work.” Since then there has been no looking back. This isn’t the story of some frat boy living the good life. He is doing everything he possibly can to make it happen as he goes along. “Spirituality is the axis which my world spins on and it keeps me going. I have high hopes for the future. The next five years are going to be an exciting time in my life.” The eternal optimist may be doing something right for all the positive vibes he’s sending out into the world seem to be reciprocating with equal measure. “Considering where I am today in life and what I do, I would say I am living my dream! There is much that I am grateful for – each morning that I am able to wake up, get off the bed and stand on my own feet, for the work that I have, the respect that I receive, for having healthy parents and being able to greet them each day; I would say I truly feel blessed. The interview time is almost over and the photographer beckons the young star to get back to the shoot floor. I ask him one last question before the lights come on and transport him away to the distant reel life. It’s the kind of pre-packaged question you ask everyone just to see if the response matches your expectations. What inspires you? Feroze pauses before he answers, “Nature! Good weather, mountains, lakes, all sorts of different people, cultures, anything and everything…but at this moment in time, it’s music!” As if on cue, Chumba Wumba’s Tubthumping gets louder, the camera zooms back into life and Feroze pulls his collar up and gazes straight into the lens. Outside, the sun has waned and given way to a velvet sky full of stars. Amidst the constellations, I spot the North Star shining bright as ever with a purpose of its own. I wish Feroze the very best before walking off. May the music never stop for you.